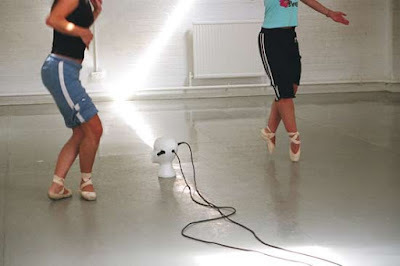 DtArNaCcE is a field recording of the sounds of the dancers and dance classes performing on location at Dance City (Newcastle-upon-Tyne). The sounds were (re)composed into DmAuNsCiEc by Andrew Hodson. Alec was commissioned by Dance City to produce a new work of art in response to the opening of the new dance centre on Temple Street – a work which would capture the essence of the old Dance City while at the same time creating an exciting work which could integrate with the new architecture. The proposal that Alec conceived was to record the sounds of dancers feet as they trained and performed. He approached the Newcastle based composer and sound artist Andrew Hodson to collaborate on the project. The final work is being realised as a permanent jukebox with a 'top forty' dance tracks. Andrew has used these found sounds for a (re)composition, DmAuNsCiEc. This bricollage is accompanied by an animated poem Alec composed in response to watching the dancers perform; now available as a CD in the latest bookscape. The jukebox was installed spring 2006 and the bookscape released in February 2006.